In this situation, anyone can offer up their opinions, and most of us do. It’s hard to figure out which analysis are better than others, because the data about partial failures is harder to get than opinions. And so most opinions are created and appear equal. Recommendations in airline security are all ‘best practices’ which are hard to evaluate. Now, as Peter Swire has pointed out, the disclosure debate pivots on if an attacker needs to expose themselves in order to test a hypothesis. If the attacker needs to show up and risk arrest or being shot to understand if a device will make it through a magnometer, that’s very different than if an attacker needs to send packets over the internet. In light of all of this, the job of a terrorist mastermind is straightforward: figure out a plan that bypasses the known defenses, then find someone to carry it out. Defending the confidentiality of approaches is hard. Randomization is an effort to change attacker’s risk profiles. But here’s the thing: between appropriate and important legal controls and that the public goes through the system, there are large parts of it which cannot be kept secret for any length of time. We need to acknowledge that and design for it. That order lays out a new balance between openness and national security, including terrorism. TSA’s current approach does not meet that new balance. Stop harassing and intimidating those like Chris Soghoian, Steven Frischling or Christopher Elliott who discuss details of the system. Encourage and engage in a fuller debate with facts, rather than speculation. There you have it. We will get better security through a broad set of approaches being brought to the problems. We will get easier travel because we will understand what we’re being asked to do and why. Everyone understand we need some level of security for air travel. Without an acrimonious, ill-informed firestorm, we’ll get more security with less pain and distraction. I had fun recording Beyond the Perimiter Episode 48 and 49 with Amrit. I think Amrit asked some of the broadest, most complex questions I’ve been asked, and it was hard to keep the episodes short. So last week I asked what people wanted to get out of RSA, and the answer was mostly silence and snark. There are some good summaries of RSA at securosis and Stiennon’s network world blog, so I won’t try to do that. A successful Research Revealed track. I think we had some great talks, a panel I’m not qualified to judge (since I was on it), and at least a couple of sell-out sessions. But you tell me. Did it work for you? See interesting new technology. 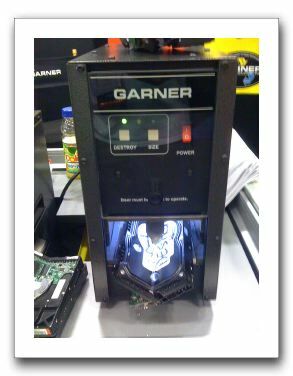 I saw three things: Garner’s hard driver crusher (they have a “destroy” button! ), Camouflage‘s database masking and some very cool credit card form factor crypto devices from Emue. (I’d add Verizon’s DBIR, but I saw that before the show.) Four interesting bits? Counts as success. Ooh, plus saw the Aptera car. Announce our new blog at Newschoolsecurity.com. Done! See friends and make five new ones. It turns out that the most successful part of this was my Open Security Foundation t-shirt. I urge you all to donate and get this highly effective networking tool. Connect five pairs of people who previously didn’t know each other. I counted seven, which makes me really happy. What I didn’t want: a hangover. Only had one, Friday morning. Will The Real Adam Shostack Please Stand Up? At one point during the RSA party hopping last week, Adam, Alex and I ended up at the Executive Women’s Forum event. I was feelng pretty punchy and decided that all three of us should have name tags that read “Adam Shostack”. If anyone asked, I just explained that we were promoting the new blog. Eventually I wandered off to another party and some other folks decided that this was a really good idea as well. By the time I got back to the W, there was a whole slew of Adam’s floating around. Those who subscribe to the “Pictures or It Didn’t Happen” school of thought can find all the evidence over on fickr photostream. I’m really excited to announce NewSchoolSecurity.com, the blog inspired by the book. I’ll be blogging with Alex Hutton, Chandler Howell and Brooke Paul. And who knows, maybe we’ll even get a post or two from Andrew? Emergent Chaos will continue. My posts here will be a little more on the privacy, liberty and economics end of things, with my technical and business security split between The New School. The content is really exciting. From the opening with a top rated speaker, Betsy Nichols, who’ll be talking about “Crunching Metrics from Public Security Data” continuing to Gene Kim’s talk about applying real analysis of practice to virtualization and a great panel talking about lessons learned from Election 2008, this track is just packed with hard facts and practical analysis. Because I’m so excited by this, I’ve put the data into a Research Revealed .ics file you can use to bring these into your calendar.